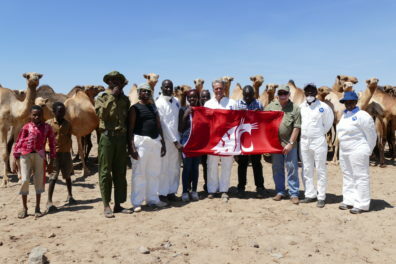 Dr. Bryan Slinker in Marsabit, Kenya where Allen School scientists are studying MERS. When Paul Allen visited East Africa, he saw how people’s daily lives could be improved and the desire for local institutions to better serve people in need. His experience motivated his generosity, and today the reach of his namesake Paul G. Allen School for Global Animal Health and its service to people has expanded even more than its founders could have imagined. On a recent trip to Kenya, I visited the University of Nairobi. 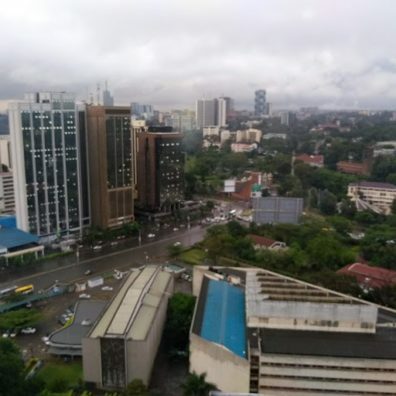 From Vice Chancellor Peter Mulwa Felix Mbithi’s conference room, I look out over Nairobi. It is a bustling city of about 3.5 million people from which WSU global health programs radiate across the region to study many important issues ranging from Zika virus to malnutrition. Key partnerships with the Centers for Disease Control in Kenya, the Kenya Medical Research Institute, and the University of Nairobi foster the collaborations needed to accomplish our missions. Because Vice Chancellor (i.e., President) Mbithi is a veterinarian and former dean of the University of Nairobi’s Faculty of Veterinary Medicine, he understands and supports our One Health approach, especially as it relates to collaboration between our universities. Together we foster development of their faculty through research and joint training grants for graduate education and mentoring of their health professions faculty to write grants and research papers. Such capacity building conjointly with this university partner is a long-term investment to sustainably improve people’s lives by building the research capacity of Kenyans to help Kenyans. Then, for something completely different, our travels took us to Marsabit in the sparsely populated arid expanse of northern Kenya, where new programs are developing to help the pastoralists of that region whose livelihood and success depends on camels. These camels are at risk for a variety of diseases, including Middle Eastern Respiratory Syndrome, or MERS, virus and brucellosis, both of which can infect humans. Throughout Marsabit County in northwestern Kenya the camel is the most commonly owned livestock (cattle, sheep, and goats are important sources of income and food as well). Eighty percent of the county’s economy depends on livestock, of which camels are the most numerous, and yet almost nothing is known about the prevalence or consequence of these two diseases in camels, nor in the people to which these diseases can be transmitted. When I visit our programs in country I come back truly inspired. The scope of the problems and opportunities, the desire of all I encounter to improve, and the talent and commitment of our collaborators are apparent in ways not possible from reading the printed word or looking at pictures. What our team has built, and the purposes that motivate their work, make me proud. Marsabit, Kenya. (l–r) Diba Denge, animal health assistant; Arithi Mutembi, MERS study field veterinarian; Millicent Minayo, MERS study nurse; Tom Kawula, director of the Allen School; Isaac Ngere, Allen School adjunct faculty and physician co-coordinator of MERS project; Bryan Slinker, dean of the College of Veterinary Medicine; Boru Wato, undergraduate MERS study intern; Peninah Munya, CDC veterinary epidemiologist and MERS project co-coordinator. The view of Nairobi from the University of Nairobi.